KnowBe4 is the world’s most popular integrated platform for awareness training combined with simulated phishing attacks. We help thousands of organizations to manage the continuing problem of social engineering. We offer three Training Access Levels: I, II, and Unlimited, giving you access to our content library of 300+ items based on your subscription level. Unlimited access to all phishing features. No artificial license ceilings and 10% overage allowance. 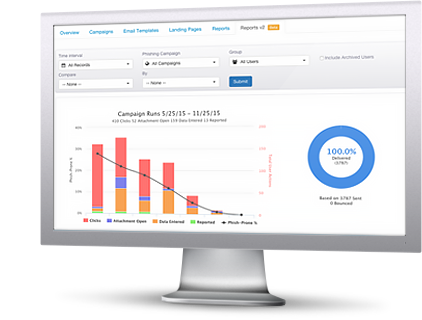 KnowBe4 is the world’s most popular integrated Security Awareness Training and Simulated Phishing platform with over 8,000 customers. Based on Kevin’s 30+ year unique first-hand hacking experience, you now have a platform to better manage the urgent IT security problems of social engineering, spear-phishing and ransomware attacks. With world-class, user-friendly new-school Security Awareness Training, KnowBe4 gives you self-service enrollment, and both pre-and post-training phishing security tests that show you the percentage of end-users that are Phish-prone. KnowBe4’s highly effective, frequent, random Phishing Security Tests provide several remedial options in case an employee falls for a simulated phishing attack. Find out how thousands of organizations have mobilized their end-users as their last line of defense. Your peers rate KnowBe4 4.8 out of 5.0 at Gartner’s PeerInsights. 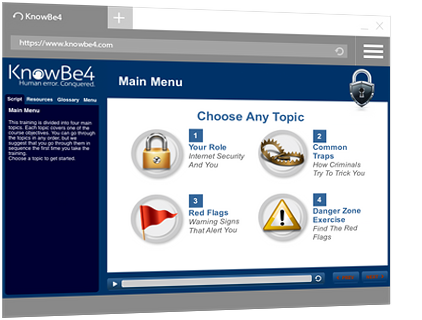 KnowBe4 provides you with the world’s largest library of security awareness training content; including interactive modules, videos, games, posters and newsletters. We offer three Training Access Levels: I, II, and Unlimited, giving you access to our content library of 300+ items based on your subscription level. You will get web-based, on-demand, engaging training that addresses the needs of any organization whether you have 50, 500 or 5,000 users. Kevin Mitnick Security Awareness Training specializes in making sure employees understand the mechanisms of spam, phishing, spear-phishing, malware and social engineering; and are able to apply this knowledge in their day-to-day job. Trainees get a unique job-aid: Social Engineering Red Flags™ with 22 things to watch out for. 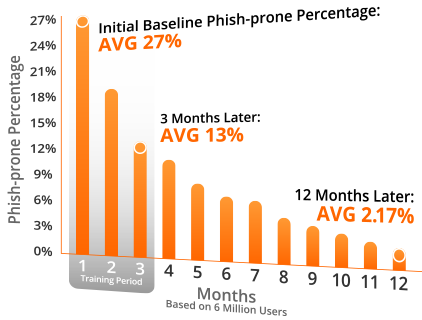 The Training Campaigns do the heavy lifting of getting users through their training. Our 5,- 15-, 25- and 45-minute basic training modules specialize in making sure employees understand the mechanisms of spam, phishing, spear-phishing, malware and social engineering, and are able to apply this knowledge in their day-to-day job. You get high quality web-based interactive training combined with common traps, live demonstration videos, short comprehension tests and scenario-based Danger Zone exercises. An advanced, condensed 15-minute version which specifically focuses on APT and phishing and is now available in 26 languages. You can schedule regular Phishing Security Tests (PST for short) from our large library of more than 500 “known-to-work” templates, choose from the community templates section, which were created by admins for admins to share with their peers. You can also create your own custom phishing templates. There are many more features! Our new Phishing Reply Tracking allows you to track if a user replies to a simulated phishing email and can capture the information sent in the reply. You can also track links clicked by users as well as test and track if users are opening Office attachments and then enabling macros. 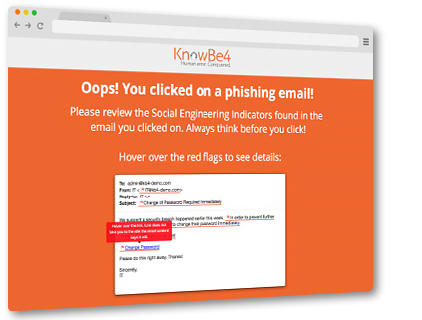 In addition, KnowBe4’s Phish Alert Button reinforces your organization’s security culture, users can report suspicious emails with one click. Phishing Reply Tracking™ allows you to track if a user replies to a simulated phishing email and can capture the information sent in the reply. This feature works hand-in-hand with the simulated CEO Fraud attacks you can launch to inoculate high-risk employees. Social Engineering Indicators™ (SEI) patent-pending technology, turns every simulated phishing email into a tool IT can use to instantly train employees. When a user clicks on any of the 700+ KnowBe4 simulated phishing emails, they are routed to a landing page that includes a dynamic copy of that phishing email showing all the red flags. You can also customize any simulated phishing email and create your own red flags. Users can then immediately see the potential pitfalls and learn to spot the indicators they missed in the future. USB Drive Test™ allows you to test your user’s reactions to unknown USBs, on average 45% of users will plug in USBs they find! You can download a special, “beaconized” Microsoft Office file from your KnowBe4 admin console onto any USB drive which you can drop at an on-site high traffic area. If an employee picks up the USB drive, plugs it in their workstation, and opens the file, it will “call home” and report the fail. Should a user also enable the macros in the file, then additional data is also tracked and made available in the admin console. GEO-location lets you see where your simulated phishing attack failures are on a map, with drilldown capability and CSV-export options. Vulnerable Browser Plugin Detection automatically detect what vulnerable plugins any clickers on your phishing tests have installed in their browsers and can be viewed within your console. EZXploit™ has patent-pending functionality that allows you to do an internal, fully automated “human pentest” at a fraction of the cost to do this manually. EZXploit takes your simulated phishing attacks to the next level. You can now find out which of your users can actually be exploited by hackers.